Schneider Regional Medical Center, originally uploaded by captainjay. 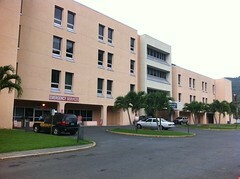 I finally got to see the hospital on St. Thomas. We've been here over three years and haven't had to visit it, thankfully. But while a friend was visiting last week she slipped and broke her wrist. We went on a Saturday morning and there was no one in the waiting room. We were hoping there was an urgent care vs going to the ER but we didn't see one. But as it worked out, they took her right back (I got to go back with her) and got an X-ray. The ER doctor was going to splint it but after my friend, who is an RN, started asking some questions, they called in the on-call Orthopedic. He took a look, gave her a painful shot in the wrist, reset it and splint it. He did another X-ray and they both felt pretty good about how it turned out. He said she may need surgery later but it just depended on how it healed. She got copies of the X-rays to take home and we were on our way. I have to say it was a pretty pleasant experience. Everyone was really nice, very professional and the hospital equipment was top notch. My friend gave it thumbs up (only one though since the other was casted lol). Since going back stateside, she had it reexamined and the doctor said the STT doctor did an excellent job and it looks like she won't need surgery. She'll be casted for six weeks, which is a bummer, but no surgery. overall, was a very good experience. I wanted to share that so everyone knows you don't have to be worried about going to the ER if something happens while on island. Our concerns were mainly that we didn't want to waste an entire day sitting at the hospital due to being over crowded, under staffed, with disgruntled employees, that move at a snails pace , which is what you find at a lot of government and quasi government offices here. But that wasn't the case at all. The staff were very pleasant, the process moved very quickly and we were out in a blink of the eye.